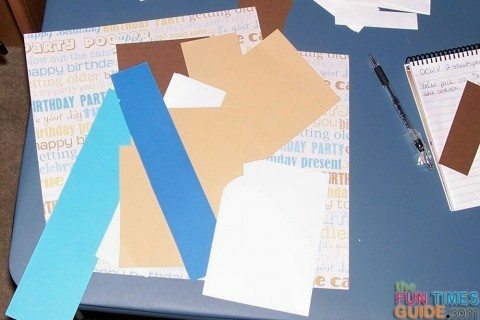 DIY Birthday Cards For Men, Women & Children: How To Make A Birthday Card For Everyone! This will probably become my “go to” make-it-in-a-hurry Birthday card. I needed a card for my brother. Cards for guys are always harder for me to create. 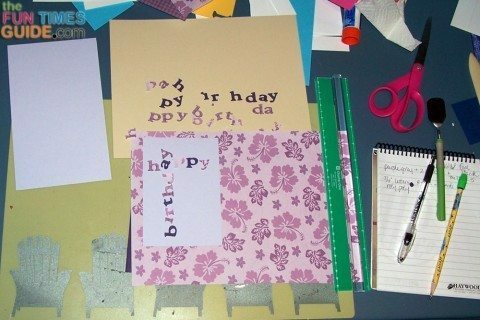 This is a great Birthday card to make from paper scraps! 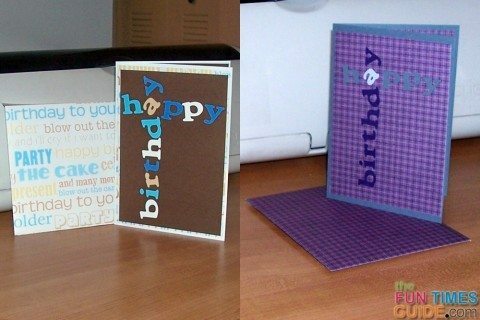 I’ll show you how to make this card 2 different ways. I found the sheets of Happy Birthday paper in my DCWV Stack. 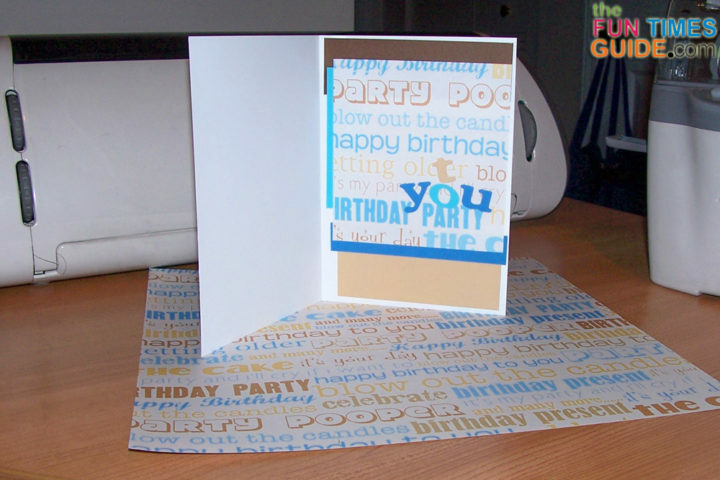 I used part of one sheet for the card and the other sheet to make a matching envelope. The base card is white cardstock, folded to 5.25″ x 7.25″. The front of the card has brown cardstock (4.5″ x 6.5″) and then the Birthday paper (4.75″ x 6.75″). The letters are cut from 4 colors of cardstock scraps: green, blue, white and tan. I chose colors that are similar to those in the Birthday paper. I used my Cricut Expressions and the Plantin Schoolbook cartridge, using the roly poly setting at 1″. I followed the design from this Birthday card I found on Pinterest to place “Happy” across the top and “Birthday” reading from bottom to top, facing the right edge of the card. The “a” is set on a diagonal to be readable in both words. The letters can be any colors, but you will see in an example below that you do need to make sure the letters are easy to read. The inside of the card can be anything you want. I chose to use paper scraps in the colors from the front, topped off by a 4.5″ square of the Birthday paper. I used the same scraps to cut “to you” with a shared “o”. I then made a matching envelope using this method. My second card using this style was out of purple and grey cardstock, along with some purple papers from my DCWV paper stack. I used some patterned paper to make the letters, and as you can see, they are NOT easy to read when placed on the light purple paper. I tried the other purple and grey shades, but still did not like the letters. I cut new letters from solid colors and was much happier with the results. 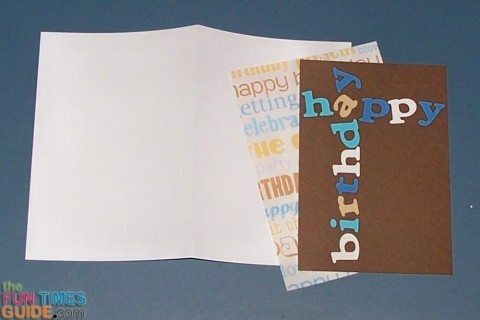 The base card is the same medium grey cardstock as the letters for “Happy”. The dark purple for “Birthday” is also used on the inside, along with a square of the purple print on the inside. I traded the shared “a” on the front with a light purple color to make it more distinct. Because I cut the entire phrase “Happy Birthday” out of 3 different colors and only used each letter once for this purple card, I now have 2 extra sets waiting to be used on new cards. This will make it easy to create multiple cards in one crafting session! As always, alphabet stickers can be used instead of making letters with a Cricut machine. Or you can cut out letters from fun computer fonts.